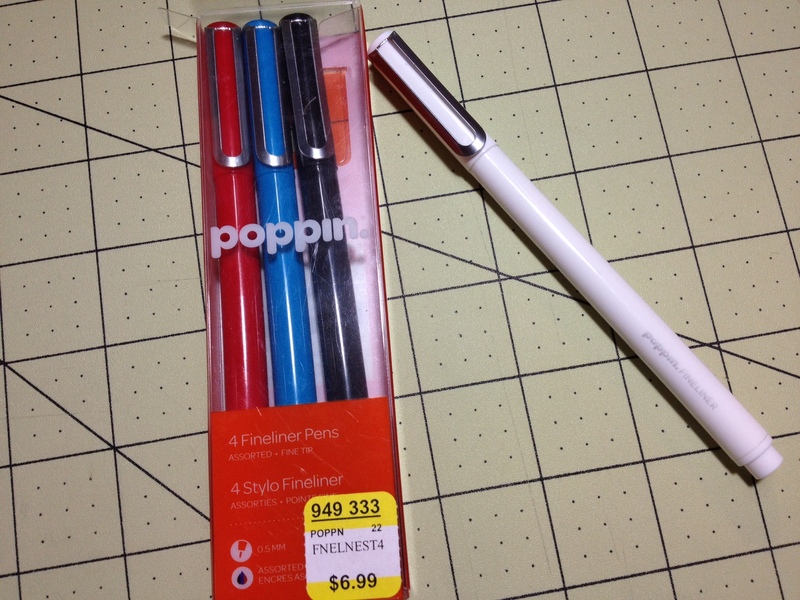 Poppin is a company that I don’t know much about, but their pens definitely catch the eye. When I saw this set of fineliners (felt tip pens) from them, I knew I had to pick a set up. The packaging and the feeling of the pens themselves appears quality, but do they live up to their first impressions? The outsides themselves are very nice looking. At the bottom is a small inset for posting the cap, which connects via a visible seam to a very smooth and featureless barrel. 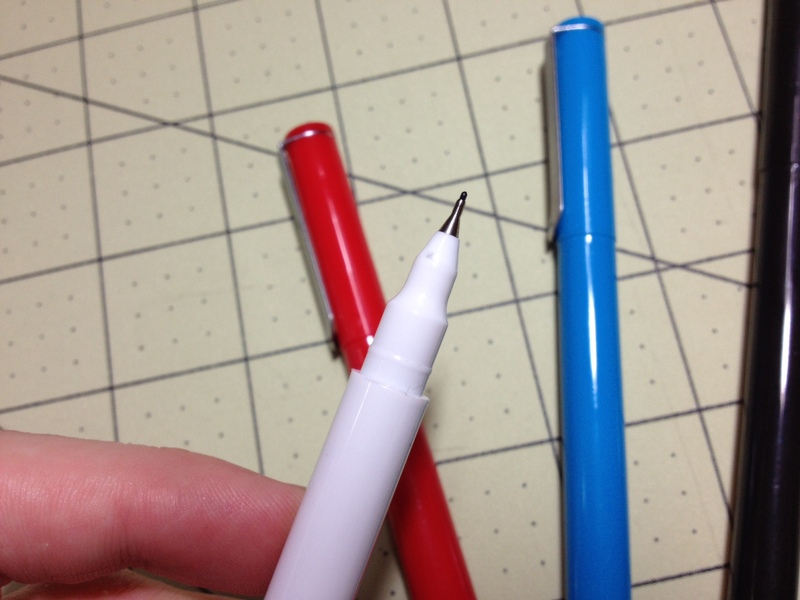 Underneath the cap are a series of step downs that are quite short and would be uncomfortable to hold, leading quickly to a standard-looking felt tip point, making it more comfortable to hold the pen by the barrel when writing. The cap, when on, has a slight step up from the barrel but is equally pleasantly smooth, and its only features are a dimple in the top and a rather unique u-like clip that looks like a Lamy wire clip that has been flattened. Functionally, the clip is about useless. It doesn’t have any dimple with which to grip, and is spaced farther from the cap than the width of most fabrics, meaning friction won’t be holding it in. The tips themselves aren’t that great, either. Like most fineliners, they do write with minimal pressure, but unlike most they do not give a consistent line. Dots very quickly form when writing or drawing due to having a very fluid ink not well controlled, and when writing fast at times skips can even develop, though this is rare. The colors of black, blue, and red are very standard, but the two extra colors are very washed out, blue especially. The blue is very pleasant sky blue when controlled well, but becomes darker quickly. But it still sticks out compared to other office blues. Red is nice and vibrant, though its tone is closer to that of a pink. It’s the least prone to problems as the ink is a bit thinner and less likely to dot. The black is fortunately a black and not a very deep purple or gray as some are. It is slightly on the cool side, which is unusual. 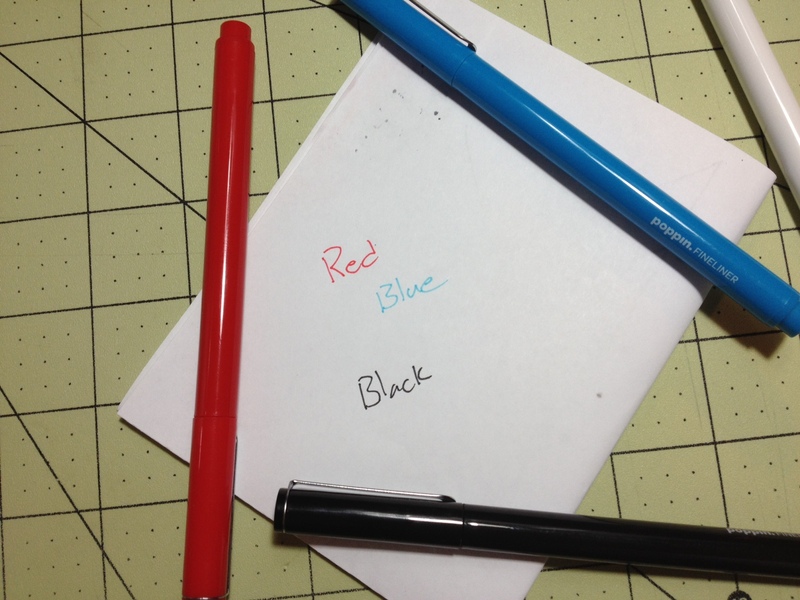 The colors do match their corresponding pen bodies fairly well, but the inclusion of a 4th pen that has a white body, but also black ink, is slightly confusing. They unfortunately do bleed through the paper, but have minimal shading and resist water (while they do spread slightly when wet, they remain easily readable). Overall I think the pens aren’t really up to par with what one can get for their office. They are sturdy and the ink works well, but without functional clips, they must remain at the desk or in a case, and their writing performance leaves much to be desired. The user just ends up with a pen that feels slightly rough and dry. If style and durability are your main concerns (and potentially ease of writing as the ink almost jumps from pen to page on contact) these might work for you. But for those looking for the superior, super-smooth and comfortable writing experience, or a portable reliable writer, these can be easily passed up. This entry was posted in Intermediate Supplies, Utensils and tagged alright, art supplies, art supply, black, blue, colors, desk, felt, felt tip, felt tip pens, fineliner, fineliners, not up to par, pens, poppin, poppins, red, review, reviews, uncomfortable, white, writing by Dragon Co (Austin Smith). Bookmark the permalink.